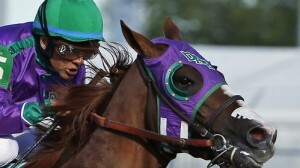 Kentucky Derby and Preakness winner California Chrome got a short break after his disappointing fourth-place finish in the Belmont Stakes, derailing his bid to become just the 12th Triple Crown winner in history. The colt had won his previous six races including winning the Kentucky Derby at betting odds of 5-2 and the Preakness Stakes at odds of 1-2. After a break this summer, his trainer Art Sherman plans on running him in a prep race, most likely at Los Alamitos, and then the colt will take on older foes in the $5 million Breeders’ Cup Classic at Santa Anita on Nov. 1. For those that bet on Kentucky Derby online and did not have the winner, there are several runners that could score in the second half of the year. Danza, who was third in the Run for the Roses at Kentucky Derby odds of 8-1, skipped the Preakness and was pointed toward the Belmont Stakes, but trainer Todd Pletcher was not satisfied with his works and the talented colt got a break, but should come back running later this year. Kentucky Derby runner up Commanding Curve and fourth-place finisher Wicked Strong could show up in two key stakes for three-year-olds this summer, the Haskell Invitational at Monmouth Park and the Travers Stakes at Saratoga. One of the best of the three-year-old-crop is Shared Belief, who did not make an appearance in the Triple Crown due to foot issues. The colt won the Hollywood Prevue and CashCall Futurity last year and won the Eclipse Award for top juvenile. Back in February, the colt was the third choice in early Kentucky Derby betting at 15-1, but his foot issues knocked him out and he did not make his three-year-old debut until May 26 where he won an allowance race at Golden Gate Fields. The colt made his first career start on conventional dirt in his most recent outing, the Los Alamitos Derby, and he ran huge, drawing away from Candy Boy to win by 4¼ lengths. Candy Boy had finished third in the Santa Anita Derby and a troubled 13th in the Kentucky Derby in his previous two starts. The colt was the fourth choice in Kentucky Derby odds at 9-1. Next up for Shared Belief is the Pacific Classic at Del Mar where it will be back to a synthetic surface. The Pacific Classic will be run on Aug. 14, which will be his first start against older runners. The late developing Tonalist is another three-year-old to keep an eye on. The colt did not make the Kentucky Derby or Preakness, but won the Belmont Stakes in his last start on June 7 at betting odds of 9-1. With the handicap division weaker than in previous years, look for California Chrome, Shared Belief, Tonalist, Danza, Commanding Curve, and Wicked Strong to be serious threats in top stakes during the second half of 2014.